CARVESMART replaces time consuming cap screwed jaws with quick change dovetailed jaws. Not having to dodge cap screw heads allows a narrower dovetailed jaw to hold the same part or more parts in a vise. A CARVESMART dovetailed jaw can be changed in 10 seconds. 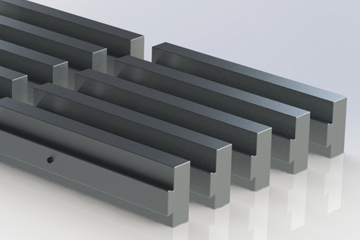 CARVESMART extruded aluminum jaw stock is available in five profiles in lengths up to 94”. You saw it to whatever length is required for the job. Jaws as short as 1” can be sawed and used for small parts. Long jaws will quickly tie the stationary jaws of multiple vises together for machining long parts and reduce chatter between vises. The more you change jaws the more you will appreciate our technology. Dovetailed jaws are available in 1018, 46/50rc and 60/62rc steel and five extruded aluminum profiles providing multiple workholding options. Tool rooms enjoy the quality, repeatability and speed of our fully accessorized system. Production shops like the set up time reduction, improved finished parts quality and our SMARTstop relocation system. Many shops are now “Saving the program not the jaw” by recutting the female form with each run. As production jobs move from machine to machine, this perfectly matches the carved form to any spindle or vise saving time and improving quality. 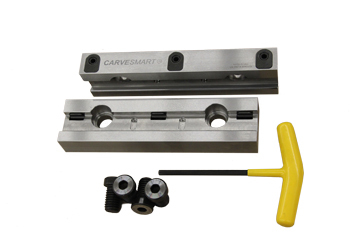 CARVESMART replaces face mounted cap screwed jaws with a fully machineable quick change vise jaw. Jaws will relocate within +/-0.0003” using SMARTstop. Same jaw same opening. Jaws will reposition within 0.001” using SMARTstop. Any jaw to any opening. 4.5”, 6” and 8” aluminum and 1018 steel SMARTstopped jaws. 46 to 50rc A2 steel machineable PERMAjaws for matched to the spindle step jaws. A jaw can be changed in less than 10 seconds. Aluminum jaw stock can be sawed to any length. Jaws as short as 1” can be used for small parts. Long jaws can tie multiple stationary jaws together. 4140 steel master jaw sets are ground flat and parallel within 0.0002"